E.R.I. functions as an Engine Parts Buying Group, serving Independent Machine Shops and Wholesale/Retail Jobbers from Coast to Coast. 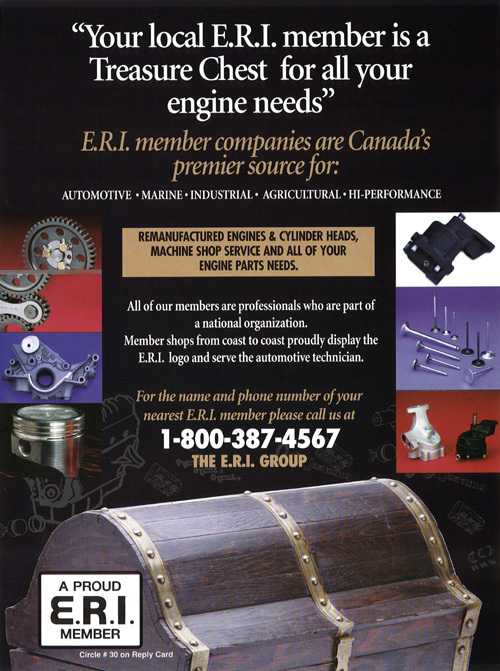 We are a wholly owned subsidiary of the Canadian Association of Automotive Engine Rebuilders Inc., a not-for-profit Corporation, meaning that E.R.I. is owned and controlled by the members. Our Mission is to assist our members to gain profitability, respect and market share in their respective trading area. We have supply agreements with many major manufacturers and re-manufacturers to provide products for our members from most major centres in Canada. We also enjoy similar arrangements with several U.S. based companies and provide simple ordering & shipping procedures for products shipped from the U.S.
We also have our own dedicated Warehousing facilities, Independent Parts Warehousing Inc., with locations in Stouffville Ontario, Edmonton Alberta and Delta British Columbia, where we stock products from some of our suppliers and also act as a fee warehouse for some of our other suppliers. Should you have a need for a re-manufactured engine, cylinder head, internal engine parts or machine shop services for cars, light trucks, heavy trucks, agricultural, industrial or high performance engines please CONTACT us and we would be be more than happy to refer you to one of our members. We also have available 24 or 36 month extended warranties for re-manufactured engines built and sold by E.R.I. member companies. The E.R.I. Engine Warranty Program is available through most E.R.I. members in Canada. Further information is available in the PRODUCT PROVIDERS section under Engine Warranty Program or by contacting an E.R.I. member in your area.